Wahama senior Isaiah Pauley (14) releases a three-point attempt during a Dec. 22 TVC Hocking boys basketball contest against South Gallia in Mercerville, Ohio. Wahama senior Anthony Ortiz dribbles down the lane during a Dec. 19 TVC Hocking boys basketball contest against Trimble at Gary Clark Court in Mason, W.Va.
ELIZABETH, W.Va. — It started with a heart-breaker … and ended with a thud. 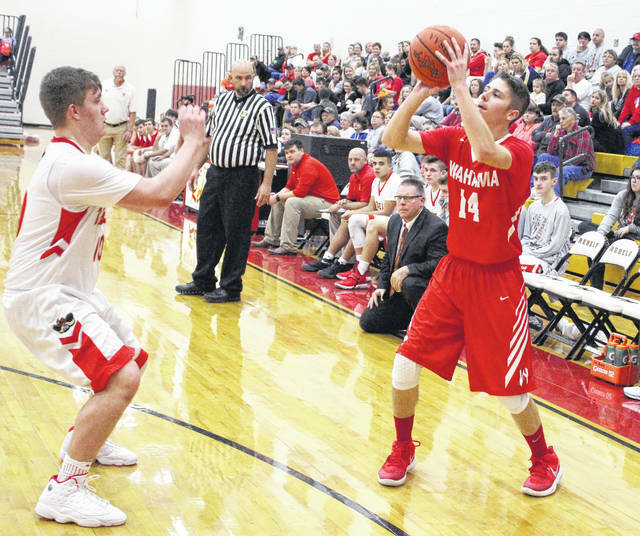 The Wahama boys basketball team was left feeling a little Grinchy a few days after Christmas following a pair of setbacks at the 2017 Wirt County Holiday Classic held Wednesday and Thursday at Wirt County High School. The White Falcons (1-6) made a late rally, but suffered a 54-53 loss to Buffalo in the opening round on Wednesday. WHS followed with a less-than-stellar performance against Wirt County in the consolation round on Thursday after dropping a 66-41 decision to the host Tigers. The Red and White found itself playing catch-up in the opener with the Bison (2-3) after falling behind 22-13 after one quarter of play, but Wahama answered with four trifectas as part of a 19-13 second quarter run that closed the halftime deficit down to 35-32. Buffalo, however, held WHS without a field goal during a 12-3 third quarter charge that gave the Blue and Gold a commanding 47-35 advantage headed into the finale. The White Falcons answered with a furious 18-7 charge down the stretch, but ultimately ran out of time in their comeback bid. Wahama made 18 total field goals — including six three-pointers — and also went 11-of-13 at the free throw line for 85 percent. Noah Litchfield led WHS with a game-high 27 points, with 11 of those coming in the opening frame and 19 by halftime. Abram Pauley was next with nine points, followed by Skyler Estep with seven markers. Dakota Belcher and Jacob Warth each contributed four points, while Tyler Bumgarner rounded things out with two points. Buffalo netted 20 total field goals — including five trifectas — and also went 9-of-12 at the charity stripe for 75 percent. Noah Thompson led BHS with 20 points and Tyler Morlachetta added 14 points, followed by Ty Parkins with eight markers. Stephen Brown, Jackson England and Dalton Huddle completed the winning tally with four points apiece. Williamstown defeated WCHS 61-47 in the second opening round contest, which set up the consolation game between Wahama and the Tigers. The White Falcons got a pair of three-pointers early on from Tyler Bumgarner, but the hosts took an early 18-11 edge and ultimately never looked back. The Tigers followed with a 13-11 run to take a 31-22 lead into the intermission, then made a 14-7 third quarter run to extend their cushion out to 45-29 headed into the finale. The Orange and Black closed regulation with a 21-12 surge — including an 11-of-12 effort from the free throw line — to wrap up the 25-point outcome. The White Falcons made 14 total field goals — including two trifectas — and also went 11-of-22 at the free throw line for 50 percent. Belcher led WHS with 12 points, followed by Warth with seven points and Tyler Bumgarner with six markers. Estep was next with five points, while Litchfield, Abram Pauley and Brady Bumgarner were next with three points apiece. Isaiah Pauley completed the White Falcon tally with two markers. The Tigers (2-4) netted 19 total field goals — including a trio of three-pointers — and also went 25-of-34 at the charity stripe for 58 percent for 58 percent. Hunter Hickman paced WCHS with a game-high 15 points, followed by Trenton Burdette with 10 points and Justin Windland with nine markers. Zakk Adams was next with eight points and Seth Suslik chipped in seven points, while Blake Batten and Kyler Carper contributed six markers each. Dalton Griffin and Trent Toler completed the winning tally with three and two points, respectively. Williamstown (5-1) claimed the 2017 Wirt County Holiday Classic title with a 56-35 victory over Buffalo. 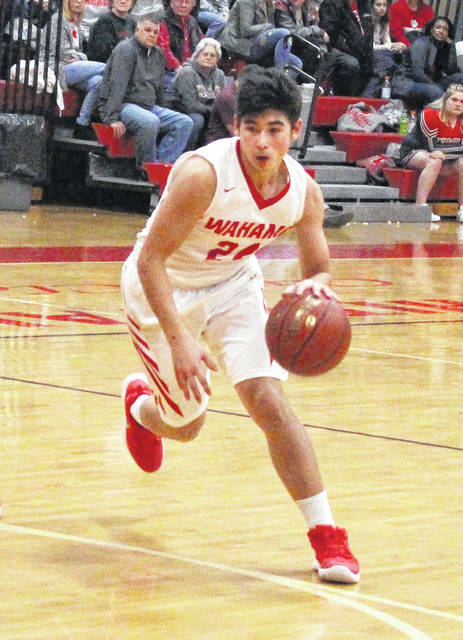 Wahama hosted Hannan on Friday night and returns to action Friday, Jan. 5, when it travels to Stewart to face Federal Hocking in a TVC Hocking contest at 7:30 p.m.